(Excerpts from studies undertaken under contract with the National Science Foundation and the Office of Naval Research and from review of the literature. Additional data obtained from the Historical Catalogs of Tsunamis in Alaska. Most photographs were obtained from archives of the International Tsunami Information Center). The second largest earthquake of the 20th Century and the largest ever recorded in the northern hemisphere,occurred in Alaska on March 27, 1964 (3/27/64 05:36:14.0 p.m., local time; 3/28/64 03:36:14.0 GMT). The earthquake had a magnitude 9.2 (Moment Magnitude) and caused extensive damage in Alaska. Local tsunami waves triggered by this earthquake were extremely destructive in Prince William Sound and other areas of Alaska. A Pacific-wide tsunami was generated which was destructive in Western Canada, Oregon, California and the Hawaiian islands. It was recorded by tide gages throughout the Pacific. Even tide gauges in Cuba and Puerto Rico recorded sea level oscillations from that event. A Tsunami Warning was issued by the Tsunami Warning System in Honolulu for Hawaii and the West coast of United States and Canada. Regional Tsunami Warning Centers in Japan, Chile, the former Soviet Union and elsewhere, issued warnings. Combined, the earthquake and tsunami took 125 lives (tsunami 110, earthquake 15), and caused about $311 million in property loss (in 1964 dollars). Earthquake Magnitude: The Surface-wave magnitude calculated in 1964, was 8.4 on the Richter scale. The Moment Magnitude calculated later was 9.2, making this event the second largest earthquake ever recorded in the world and the largest for the Northern Hemisphere. (Moment Magnitude provides a better measure of energy release for larger earthquakes; the May 22, 1960 earthquake in Chile had a Moment Magnitude of 9.5, the largest earthquake ever recorded). Focal Depth: Approximately 25 km. There were 52 larger aftershocks which were heavily concentrated on the northeast and the southwest of the uplifted region (USC&GS, 1964), (which was also the tsunami generating region). The largest had a magnitude of 6.7. The first 11 of these aftershocks, with magnitude greater than 6.0 on the Richter scale, occurred in the first day; in the next three weeks there were 9 more of similar magnitude. Aftershocks continued for more than a year. Thousands of such smaller aftershocks were recorded in the months following the main earthquake. The aftershock zone of the Great Alaska Earthquake was about 250 km wide and extended from about 15 km north of Valdez in Prince William Sound for 800 km to the SW end of Kodiak Island to about 55 km. south of the Trinity Islands. The main shock and its aftershocks occurred on a fault which marks part of the boundary between the Pacific and North American tectonic plates. where M is the Richter magnitude given by log E(ergs) - 11.8 + 1.5 M . An estimatesof earthquake energy of approximately 6x10 (raised to the 25 power) in ergs given by the author elsewhere for this earthquake, represents only a portion of the total earthquake energy of the Great Alaska earthquake. Richter magnitude saturates and does not provide a very accurate measure of total earthquake energy. Presently, Moment Magnitude is used as it is a better measure of earthquake energy release. Thus, the energy of the Great Alaska Earthquake was much greater than what has been reported. Plate Tectonics: The tectonic history of the region shows that the Pacific plate moves in a northwestern direction at about 5 to 7 cm per year. This Pacific tectonic plate movement causes the crust of southern Alaska to be compressed and warped, with some areas along the coast being depressed while other areas inland are being uplifted. At time intervals ranging from tens to hundreds of years, this compression is relieved by the sudden motions of large portions of the coastal portion of Alaska moving back in a southeastern direction over the subducting Pacific plate. Area Over Which the Great Alaska Earthquake Was Felt: The earthquake was the strongest ever felt in North America. The area over which it was felt encompassed approximately 1,300,000 km2 (all of Alaska,parts of western Yukon Territory and British Columbia, Canada and the State of Washington). Horizontal Displacements: As a result of the 1964 earthquake quake, the net horizontal movement of the Pacific plate under the North American plate was about 9 meters on the average in a southeast direction, although some sections apparently moved considerably more. For example, Latouche Island area moved about 18 meters to the southeast. Uplift and Subsidence: The earthquake caused vertical displacements which ranged from about 15 meters of uplift to 2.3 meters of subsidence relative to sea level. Patterns of uplift and subsidence which had been slowly developing prior to the earthquake were suddenly reversed. For example, average uplift at Montague Island was 4-9 meters while off the southwest end of the island, there was vertical displacement ranging around 13 - 15 meters. Uplift also occurred along the extreme southeast coast of Kodiak Island while at Women's Bay, on the same island, subsidence of 1.7 meters was measured from tide gauges datum. Sitkalidak Island, and over part or all of Sitkinak experience uplift while areas around Portage subsided by as much as 3 meters. Other areas had no change. The zero line (line of no vertical change separating the uplift and subsidence zones) extended from near the epicenter in Prince William Sound to the SE coast of Kodiak Island. The zone of subsidence covered about approximately 285,000 square kilometers. It included the the west part of the Chugach Mountains, the north and west parts of Prince William Sound, most of Kenai Peninsula, and almost all the Kodiak Island group, all the way to Trinity islands. AUTHOR'S NOTE: Although the dimensions of the affected area were somewhat understated by the author in a previous publication as land surveys were still pending (see Source Mechanism Study of the Great Alaska Earthquake and Tsunami of 1964), in calculating the tsunami energy, the tsunami generating area was correctly estimated to encompass approximately 140,000 km2 (sq. Km) as shown in the adjacent map. This is the area of displacements under water as determined independently from tsunami wave refraction. Similarly reasonable is the estimate of total crustal volume of displacement of the ocean floor being 120 km3 (cubic km)(for tsunami energy calculations) in the tsunami-generating area in the Gulf of Alaska. The area of Prince William Sound was excluded. The estimates were arrived at from measurements of subsidence and uplift at Kodiak, Sitkalidak, Sitkinak and Portage and at Montague Island. Although these displacement measurements were few and sporadic, using these values and dimensions established indirectly by tsunami wave refraction results, a three-dimensional isopach of changes was obtained through mathematical integration to calculate the total volume of displacements in the ocean only. These estimates were then used to calculate the total earthquake energy that contributed to the generation of the open sea tsunami in the Gulf of Alaska, and not for the tsunami waves generated in the Prince William Sound. Seiches: The surface seismic waves traveling around the earth caused numerous Seiches in small enclosed bodies of water, such as boat harbors. In fact, seiche action in rivers, lakes, bayous, and protected harbors and waterways along the Gulf Coast of Louisiana and Texas caused minor damage. In Louisiana, several fishing boats sunk. Oscillations in the level of water in wells were reported from as far away as South Africa. The area where there was significant damage covered about 130,000 km2. Major structural damage occurred in many of the cities in Alaska, but primarily in Anchorage. Most of the structural damage of other coastal towns was primarily caused by the resulting tsunami waves. Also, the nearly four minute duration of earthquake shaking triggered many subaerial and underwater landslides, avalanches and caused ground liquefaction. Earthquake damage from the earthquake was heavy in many other towns, besides Anchorage. Towns such as Chitina, Glennallen, Homer, Hope, Kasilof, Kenai, Kodiak, Moose Pass, Portage, Seldovia, Seward, Sterling, Valdez, Wasilla, and Whittier sustained considerable earthquake damage. Although almost 120 kilometers away from the earthquake's epicenter, Anchorage sustained severe damage. Earthquake shock waves lasting approximately 3 minutes caused extensive damage or total destruction to buildings and houses over a large area of approximately 30 city blocks, mostly in the downtown area. All utilities were disrupted throughout the city and the suburbs. 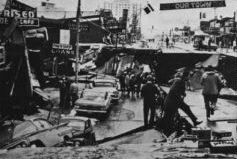 Enormous landslides contributed to heavy damage in the downtown business section. Among the many building that were destroyed or damaged beyond repair in the downtown area, were the J.C. Penney Building and the Four Seasons apartment building, the latter a newly erected six-story structure which collapsed totally. Many other substantial, multistory buildings were damaged severely beyond repair. The death toll was extremely small for a quake of this size. This was primarily due to the low population density of Alaska in 1964, the time of day (A holiday - Good Friday) and the type of material used to construct many buildings in Alaska(wood). COX, D.C. and Pararas-Carayannis, George. A Catalog of Tsunamis in Alaska. World Data Center A- Tsunami Report, No. 2, 1969. GRANTZ, A.G., G. Plafker, and R. Kachadoorlan, 1964. Alaska's Good Friday Earthquake, March 27, 1964: A Preliminary Geologic Evaluation, U.S. Geol. Survey Circ. 491, 35 pp. Effects of the Earthquake of March 27, 1964 at Whittler, Alaska, U.S. Geol Survey Prof. Paper 542-B, 21 pp. KACHADOORIAN, R. and G. Plafker, 1966. Effects of the Earthquake of March 27, 1964 at Kodiak and Other Communities on the Kodiak Islands, U.S. Geol. Survey Prof. Paper 542-F, 41 pp. Effects of the Earthquake of March 27, 1964 at Seward, Alaska, U.S. Geol. Survey Prof. Paper 542-E, 43 pp. Source Mechanism Study of the Alaska Earthquake and Tsunami of 27 March 1964, The Water Waves. Pacific Science. Vol. XXI, No. 3, July 1967. "A Study of the Source Mechanism of the Alaska Earthquake and Tsunami of March 27, 1964." Volume on Seismology and Geodesy on the Great Alaska Earthquake of 1964, National Academy of Sciences, Washington D.C., pp 249- 258, 1972. PLAEKER, G. and R. Kachadoorian, 1966. Geologic Effects of the March 1964 Earthquake and Associated Seismic Sea Wave on Kodiak and Nearby Islands, Alaska, U.S. Geol. Survey Prof. Paper 543-D, 46 pp. PLAFKER, G. and L.R. Mayo, 1965. SEISMOL. DIVISION, USC & GS, 1964. Preliminary Report: Prince William Sound, Alaskan Earthquake, March-April 1964, U.S. Coast and Geod. Survey, 83 pp. The Prince William Sound, Alaska, Earthquake of 1964 and Aftershocks, v. 1, Operational Phases, U.S. Coast and Geodetic Survey, No. 10-3, 263 pp.